The State of VR Survey: Keep Going Agent! We hope you had some great holidays! We’re back in the office after a month of moving and of various family activities and our new DV1 Knuckles have arrived. 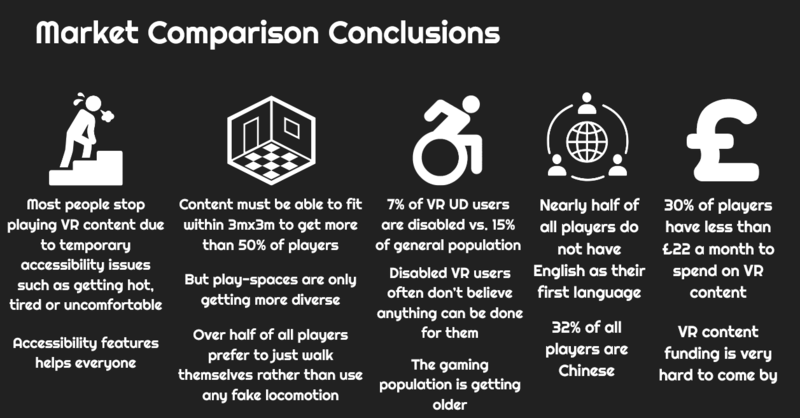 This weeks blog post we’re continuing to analyse the results of our survey, and will be covering accessibility issues. Why do people stop playing? 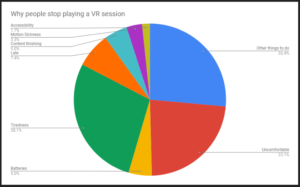 I wanted to find out exactly why people would finish a VR session. I remember playing Guitar Hero and Rock Band until my hand hurt so bad and I couldn’t move my fingers any more, while other games I’ve completed in a single session. It was quite a mix of reasons! What was interesting was the amount of people stopping playing not because of the content finishing or it getting late into the evening, but seeing how many said the hardware was uncomfortable or they were physically tired. As game devs, there really should be something we can do about these, accessibility and motion sickness issues. This is especially the case as Unseen Diplomacy is so physical – it would be very easy for players to get tired quickly. It’s estimated that 15% of the world’s population are disabled, and more so in developing countries. 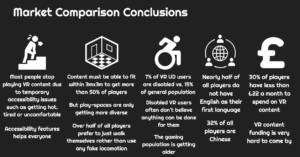 6.7% of Unseen Diplomacy fans are disabled – this reduced number tells us that there’s a fair few disabled players who don’t play Unseen Diplomacy or VR. We also asked our disabled users if they felt like there was anything VR developers could do to help them. 37.5% of these fans believed there was nothing we could do. 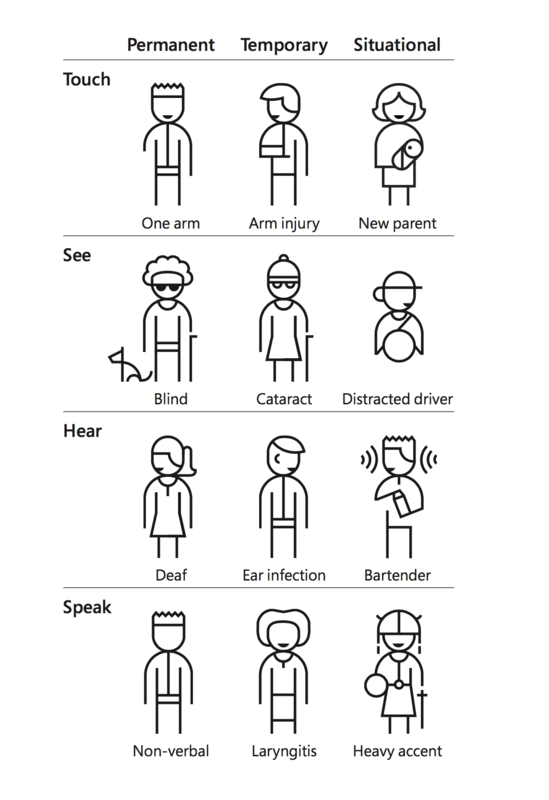 This made me quite sad, as a disabled designer I always feel like there can be just small little changes I could do. Diabetes? Then maybe I need to add real world clocks into the game, and add the ability do create play limits so that you can stop and eat when you need. Tremor? Then we could add the ability to smooth movements of your hands and have a slider for you to slow down the gameplay a little bit. We need to do more as developers to inform you of what we can do to help, try and make those changes, so you can spread the world and ask other devs to make those changes for you too and make your gaming life just that much better. I had already seen that accessibility features help everyone – who of us have used subtitles when it’s been a bit noisy or when we couldn’t switch on the audio for something we have been watching? 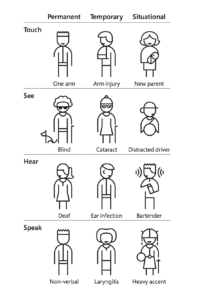 With my work with the SWCTN I found out about this idea of permanent, temporary and situational accessibility issues. If you have a temporary accessibility issue, it may be that you have a illness or an injury that’ll go away at some point. Many of us face situational accessibility issues on a daily basis! It may be that you’re on public transport and don’t want to switch on that audio, or perhaps you’re simply tired and just want to sit down (like 28% of you!). 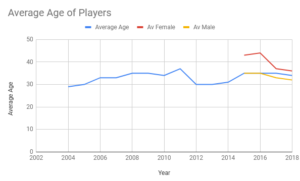 The general gaming population is aging too. I compared the ESA data for US gamers between 2002 and up to 2018. 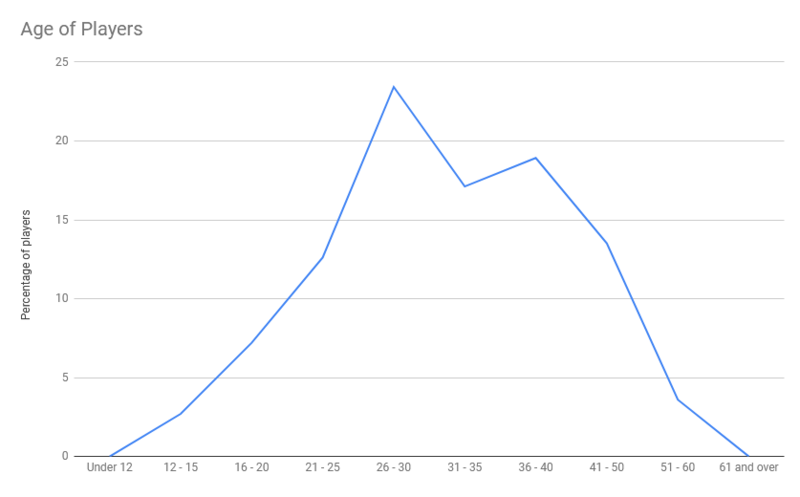 As you can see, the average age of gamers is increasing as more older people take up gaming, and the rest of us lifetime gamers get older. 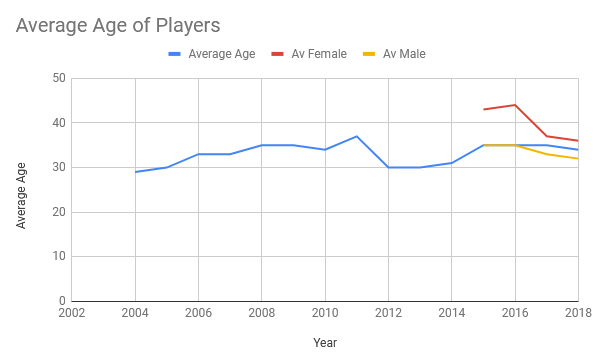 You can see two dips in the average age… I correlate that to the 2012 peak of new gamers from Minecraft, and 2017 peak from Fortnite. 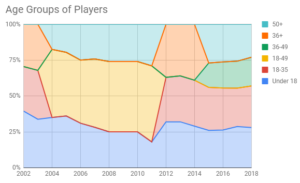 They changed the way they sorted data over the years as you can see with the graph below, but hopefully it’s still clear that gamers are getting older. How does this look for our Unseen Diplomacy fans? 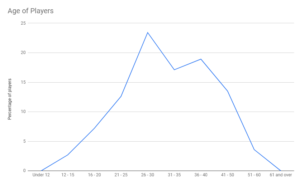 Well looks like our users trend a bit older than the average gamer. This I suspect is because the Vive and PC gaming is more expensive, and so more younger gamers tend to get gifted consoles rather than VR-ready PCs. 22% of the UK population are disabled, but disability is more likely to affect older adults over 65. They account for 45% of the disabled in the UK compared to 16% of working age adults and 6% children. As we get older… we do get more limited in our movement, sight, hearing – leading to various disabilities. If we want our older gamer crowd to be playing Unseen Diplomacy 2, and for ourselves and current fans to be playing it into the far future, we need to do something to help with those growing accessibility issues. If we want more of you to be able to play and for longer, we need to give you some more accessibility options. We did have our “no crawling” option and colour-blind symbols in Unseen Diplomacy 1, but clearly we need to do much more for you all. I made a handy cheat sheet of Unseen Diplomacy facts that we’ve found through our survey. We’ll have another blog post up soon!